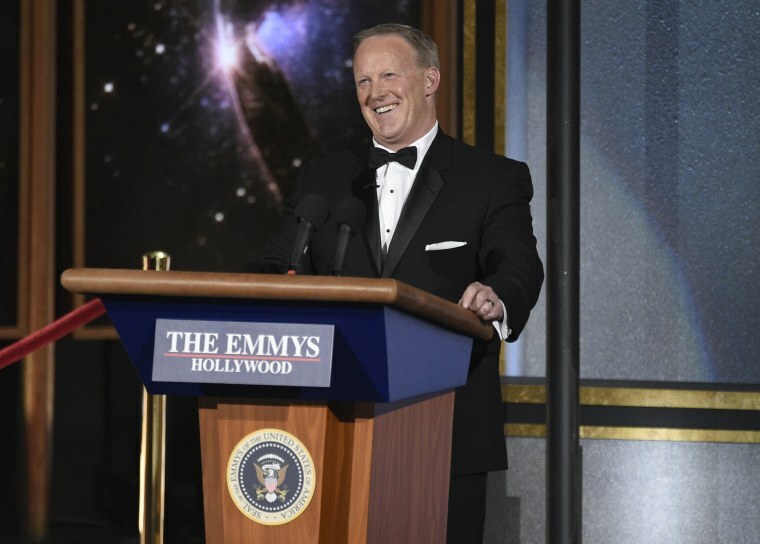 LOS ANGELES — Former White House Press Secretary Sean Spicer popped up on Sunday night's Emmy Awards to poke fun at himself. Spicer, the target of widespread ridicule after he insisted in January that the crowd at President Donald Trump's inauguration "was the largest audience to ever witness an inauguration, period, both in person and around the globe" — despite news reporting and photographs that appeared to show it wasn't. Providing the punchline to a setup by host Stephen Colbert on Sunday night, Spicer rolled in on a wheeled podium — a nod to Melissa McCarthy's portrayal of him on "Saturday Night Live" — and proclaimed: "This will be the largest audience to witness an Emmys, period, both in person and around the world." "Melissa McCarthy, everyone," Colbert joked as Spicer left the stage.